Discover how their new UN/Fold knit collection can provide luxury textile solutions for large-scale interior applications. UN/Fold is a heritage craft research initiative. 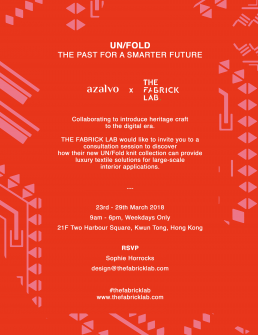 THE FABRICK LAB and AZALVO have collaborated to expand the potential applications of UN/Fold using rapid prototyping knit technologies to facilitate new scales of production; creating a new, affordable luxury lifestyle collection. The new collection of knitted textile products demonstrates how the Guizhou heritage can survive and flourish within the modern, digital era; offering wider applications. The colour, graphics and textures are inspired by traditional Guizhou textiles but have been elevated to suit modern consumer tastes. THE FABRICK LAB invites you to join them for a consultancy session to discover how these bespoke textiles and products can be utilised within contemporary interior and design projects.